The New Jersey Water Supply Authority is responsible for maintaining a dependable uninterrupted supply of water, up to 100 million gallons a day, through the Delaware & Raritan Canal (D&R Canal) to customers along the Canal’s 60 mile length. The D&R Canal water transmission complex is owned by the State of New Jersey and operated by the Authority. In the summer of 2016, the Authority had extreme difficulty passing water through the canal to its customers because of aquatic plants. SOLitude Lake Management was hired in September, 2016 to survey, assess, and map the extent of hydrilla and other problem weeds in the high-priority segments of the Delaware & Raritan Canal. The Authority received the SAV delineation report in December 2016 for these segments. The survey report indicates that, for the 18.31 miles surveyed, SAV was collected at 96 percent of the sites, confirming the spatial extent and diversity of vegetation in the Canal. Hydrilla was observed at 56 percent of the survey sites. Based on the report and input from experts in the field, the Authority determined that the necessary course of action to address this emergent issue must include a number of interrelated tasks: 1) develop a comprehensive plant management plan that defines effective control method(s) for hydrilla and other nuisance aquatic vegetation; 2) be prepared to implement effective control measures in time for the 2017 growing season; 3) survey the remaining 40 miles of the Canal that were not surveyed in 2016; 4) plan for adjustments to the management plan annually based on effectiveness monitoring; and 5) develop a robust education and outreach component to minimize further spread. Details of the Management Plan can be found here. Effective control measures for 2017, as determined by SOLitude and endorsed by NJDEP, include two options; fluridone herbicide injections and hydroraking. 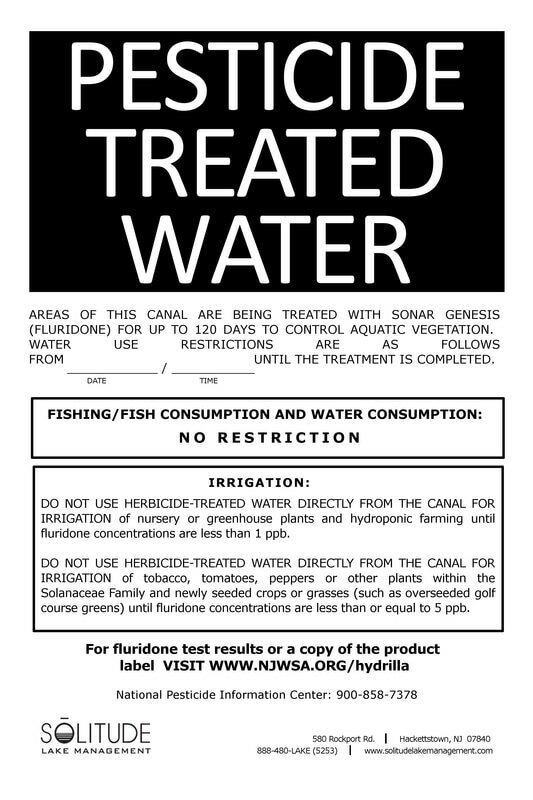 Fluridone herbicide (product info) injection is a slow-acting, systemic liquid herbicide that will be injected into the Canal at one location for up to 120 days, optimally beginning on or about May 18. The injection unit is in a locked enclosure and can be remotely operated to allow consultant staff to make daily adjustments as needed. Fluridone concentration monitoring will occur weekly throughout the duration of the season at several key locations along the Canal. The application rate will be very low (2-4 ppb), which is well below the US EPA acceptable residual level of 150 ppb. Fluridone is a selective herbicide based on application rates, and most desirable aquatic native plants will not be affected by the low dose proposed for this project. It is safe in drinking water, to humans, animals, etc. at this level. The chemical is absorbed into the tissues of some fish, but only to the concentration levels applied (it does not bioaccumulate), and will decrease after herbicide treatments end. No adverse human or animal health effects are anticipated due to exposure to fluridone under the expected concentrations. For more information on fluridone for hydrilla management including resources about human, wildlife, aquatic plant, and other environmental impacts, click here. 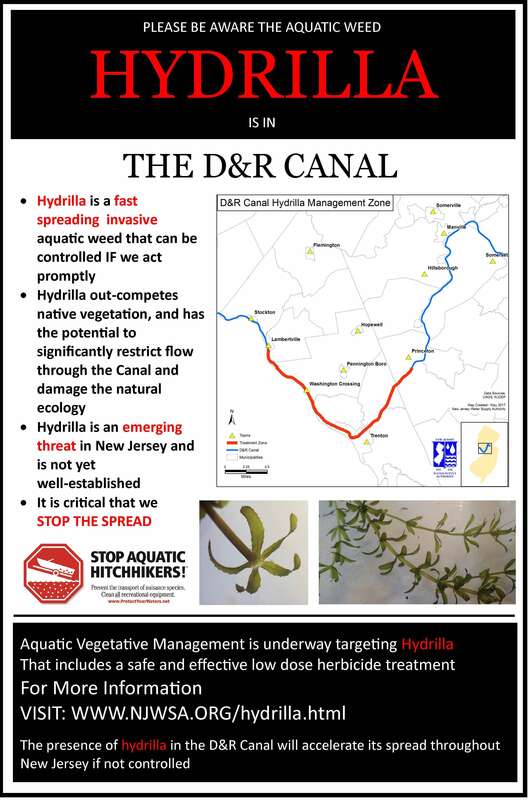 Mechanical hydro-raking, while not recommended for hydrilla control, due to the likelihood of fragmentation, is still an option for consideration in select areas of the D&R Canal to maintain passing flows. Hydro-raking was performed in 2016, and weed removal strategies are performed as needed in the Canal for operations. The hydro-rake is a custom built barge propelled by two paddle wheels with an 8 foot wide York rake attachment to a hoe. The machine has a diesel-powered hydraulic system. The hydro-rake operator removes aquatic vegetation and deposits the vegetation along the embankment where it is allowed to dry and decompose. Dependent upon the aquatic plant community, it is possible that vegetation will not be removed from the site in order to limit the potential transfer of invasive plants to other water bodies. In order to move the hydro-rake between segments of the Canal, the hydro-rake will be launched and removed by a crane, and transported via trailer by an overpass road (see pictures of 2016 operation below). This will require temporary (less than 1 hour) closures of the multi-use path for safety precautions. A trailer with the hydro-rake will be stored along the Canal during the project period. Staging areas, access points, and affected segments have the potential to be anywhere along the Canal, along the multi-use path, or embankment access roads. Hydro-raking is a last resort option to address aquatic plants, especially hydrilla, due to the likelihood of fragmentation and the potential spread downstream from the raking site. If needed as a last resort to allow for the sufficient passing of water, hydro-raking operations would likely take place between July and September.. Authority staff believes that if the hydrilla is not treated, the infestation will spread and clog the Canal, blocking the sufficient flow of water through the Canal for our customers. This would require us to release additional water from Round Valley and Spruce Run Reservoirs to make up for the deficiencies in the Canal flows. Both Reservoirs reached historically low levels in 2017 and any extra releases would further exacerbate the low level conditions.